I am a huge fan of getting my kitchen servants going in the morning in order to save time later in the day when I need to make dinner. In days past, if I didn’t get my slow cooker going right before lunch, I was in big trouble. Something has happened though to make dinner a sure bet even if I don’t load my slow cooker in the morning. What happened is called an Instant Pot electric pressure cooker. I currently own both an 8-quart Instant pot and a 14-quart GoWise electric pressure cooker (you can see both models here on my large family cooking page). The wonderful thing about an electric pressure cooker is that you can cook a meal from frozen to done in a very short time. So if we have a busier day than usual and I forget to get the slow cooker going, or if I just decide not to, I know that my electric pressure cookers can get the job done for me. On the day I made this video, we had all sorts of things going on. Baby Benjamin learned to clap his chubby little hands which required much watching and encouraging from the rest of us. Grandmother was visiting, Travis was using his amazing building and design skills out in the garage, and we were gone for a big part of the day to our homeschool group. I also hadn’t gotten in my big Mom stomping that I’m trying to get in every day. I try to get at least 10,000 steps in every day and it takes a dedicated march to achieve it. I can get around 4,000 steps in just from doing the typical Mom stuff around the house but I do want to hit that 10,000 mark as often as I can. I can load up my electric pressure cookers and take off to our forest for my Mom-walk and get in all my steps while dinner cooks without me. Gotta love that! 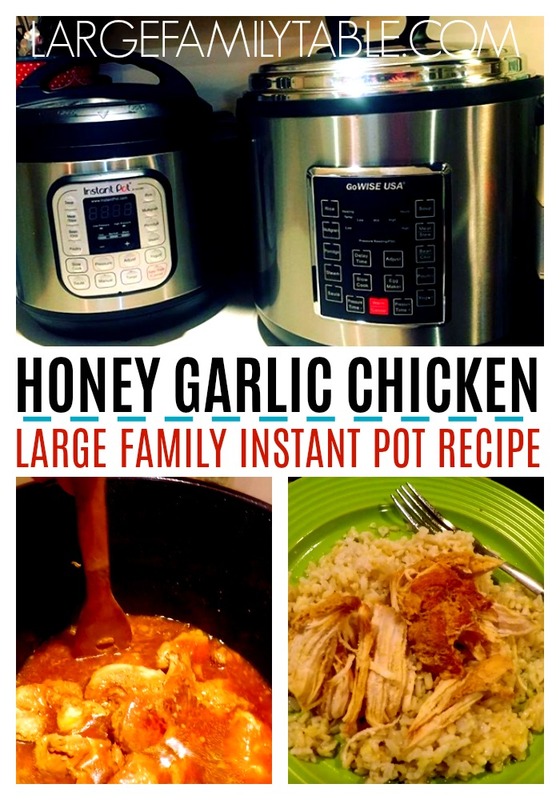 Let’s talk about how to make this yummy Chicken Instant Pot Recipe that I made for our dinner. I decided to use my 14-quart GoWise for the chicken and the smaller 8-quart Instant pot for the rice to go with it. I could have done this in my slow cooker if I had started earlier but that would have required thawed chicken and I hadn’t thought to thaw it in the frig the night before. So GoWise it is! By the time I got back from my big walk, I had 9,900 steps and our dinner was hot and ready. The electric pressure cookers have a “keep warm” function so all I had to do was walk in the door, remove the lids, and start serving plates. I hope you’ll try it and comment below and tell me if your family enjoyed it! This chicken Instant Pot Recipe is delicious served over a bed of brown rice with some fresh veggies on the side. We enjoyed raw cauliflower with ranch dressing with ours. If you’re eating low carb, you can serve it over riced cauliflower. Anyway you serve it, it is yummy! Remove steamer rack from pressure cooker. Add soy sauce, honey, and spices. 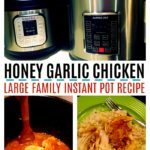 ?HONEY GARLIC CHICKEN ?INSTANT POT RECIPE | Cook with Me ~ Large Family Mom Style! Click here to watch the full Chicken Instant Pot Recipe on YouTube!! You might also be interested in how to cook potatoes in the electric pressure cooker, here’s a large family cooking recipe for weekend chili, and don’t forget this Chicken Enchilada Freezer meal – large family style of course!